The third film of the writing-producing-directing team of Michael Powell and Emeric Pressburger (and their first film as "The Archers") following Contraband (1940) and 49th Parallel (1941), "……One of Our Aircraft is Missing" (1942) is, effectively, Britain's Casablanca (also 1942). Both films revolve around characters trying to flee a Nazi-occupied land. In Casablanca the Vichy French were technically in charge (while always ceding to their German collaborators), but the desperate refugees, emboldened by the underground resistance movement, in one memorable scene defiantly sing "La Marseillaise," the French national anthem, as the Germans look on, humiliated. At the very end of the movie, Max Steiner's score also concludes with the last part of the anthem. In "……One of Our Aircraft is Missing", the crew of a downed RAF bomber attempts to flee Nazi-occupied Holland. As in Casablanca, Quislings, Dutch collaborators, are greatly outnumbered by loyalists to the House of Orange that defiantly play their national anthem, "Wilhelmus" which, like Casablanca, is heard again at the very end of the picture. And, like Casablanca, "……One of Our Aircraft is Missing" was timely as Hell. The film's unusual prologue sets the picture up as if it were a true story, or at least a recreation of one, and in fact largely is. It's not shot in a semi-documentary style though in many respects it's extremely naturalistic, the absence of a musical score being one example. The fate of the Netherlands, and indeed the entire war, was, as yet, unknown. In another typically Powell-Pressburgerian touch, there's a flash-forward two years into the future at the end, as characters prepare to bomb Berlin, the heart of Nazi Germany, and thus presumably bring about the liberation of the Netherlands. In fact, the country wasn't liberated until May 1945, the very end of the war, following a horrific nationwide famine and the deaths of 75% of its Jewish population. So, like Casablanca, watching "……One of Our Aircraft is Missing" with the mindset that its 1942 and not 2016, the picture still has enormous power. It's almost unbearably suspenseful at times, unexpectedly touching toward the end, and genuinely rousing. Though unquestionably wartime propaganda, its story oozes with verisimilitude (as opposed to the impossible heroics often found in Hollywood wartime films). It's a tribute to the bravery of both RAF airmen and the Netherlander Resistance, refreshingly exemplified by two courageous women. After the opening titles, we're back in time to the hours before the ill-fated mission, a nighttime raid over Stuttgart. The crew of "B for Bertie" is introduced: pilots John Glyn Haggard (Hugh Burden) and Tom Earnshaw (Eric Portman), navigator Frank Shelley (Hugh Williams), wireless operator Bob Ashley (Emrys Johns), front gunner Geoff Hickman (Bernard Miles), and front gunner Sir George Corbett (Godfrey Tearle), a last-minute replacement as he wants to be a part of a final mission before retiring. They pull off their Stuttgart raid without incident, but on their way back to England are hit by anti-aircraft flack, knocking out one of their engines and the crew is forced to bail over Holland. The next morning all quietly reunite in the Dutch countryside save Ashley, who has gone missing. They make their way to a village where the locals, lead by English-speaking schoolteacher Else Meertens (Pamela Brown) initially are as suspicious of them as they are of the villagers. Quickly though, both realize they're fighting the same enemy and with the support of the local burgomaster (Hay Petrie) and Catholic priest (Peter Ustinov, in his movie debut), are smuggled across the countryside and into the arms of wealthy widow Jo de Vries (Googie Withers), a loyal Dutch woman masquerading as a Nazi sympathizer. "……One of Our Aircraft is Missing" is wonderful from beginning to end. The editing, both structure-wise and the cutting of individual scenes by future director David Lean, is consistently inventive, maximizing suspense some of the time, while providing unexpected moments of quiet intimacy at others. Another future director (and Lean collaborator), Ronald Neame, was its cinematographer, and he finds a perfect balance in set-ups that are simultaneously dramatic and naturalistic. The first half-hour takes place primarily aboard the bomber. Its claustrophobic interior and the absence of a musical score - the audience mostly hears the constant hum of the plane's engines and propellers - adds enormously to the suspense of their mission. And though there are some exterior shots of the plane in flight, mostly the audience is limited to what the crew sees, e.g., high-altitude views of Stuttgart below, a superbly lit miniature. The language barrier also helps. Unusual for this time, most of the Dutch characters speak only Dutch and the Germans only speak German. (Being a priest, Peter Ustinov not only speaks Dutch, but also Latin with an impressive Dutch accent! Neither was among the eight languages he spoke fluently.) None of this dialogue is subtitled for moviegoers, and only a small portion of it translated by other characters, making the audience work to try to understand what's being said. A real moral-booster, "……One of Our Aircraft is Missing" only rarely hard-sells its wartime message, when it's dramatically justified and honestly earned. The Nazi menace is barely seen and only in long shots. Mostly it's about a bunch of airmen just trying to get back home safely and avoid capture, but along the way they come to appreciate the courage of ordinary Dutch citizens risking their lives on their behalf. Indeed, one of the picture's unique qualities is that, while tense throughout, the RAF crew is pretty much treated to an otherwise pleasant outing of fine dining, lavish surroundings, and even a football match to enjoy. While hardly the fate of most downed RAF crews, as presented here it's improbable yet strangely believable. Most of the cast, exemplified by Googie Withers, was famous in England but largely unknown to American audiences, yet thanks to the film's power the airmen become something like mates by the midpoint. Navigator Frank sweetly catches the last fleeting moments of his singer wife's solo performance on the BBC thanks to a hidden, verboten radio. Even Sir George, potentially a stock, bossy ruling class type, shows unexpected tenderness and expresses genuine heartfelt gratitude toward Withers's character in a sweet, climatic scene. 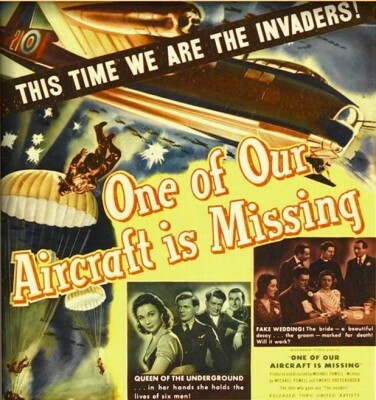 Licensed from Paramount, "……One of Our Aircraft is Missing" is presented in its original British cut, running 103 minutes. The black-and-white, standard size image has its share of scratches, and some of the dissolves in the final reel are a bit battered, but mostly it looks great. (This despite the alarming disclaimer - at Paramount's behest? - that "This film is presented using the best available elements," studio-speak for "We used an old video master." This one's fine, however.) The mono audio (with optional subtitles) is also better than adequate. No Extra Features. We're talking Powell-Pressburger here. How can it not be a DVD Talk Collector Series title?